Our Sky Room is named after the Sky Trail at Point Reyes. The blue sky seen through the skylights makes us think of the heavenly views enjoyed from parts of the ridge-wandering Sky Trail. "The first time I ever hiked the Sky Trail, I was struck by the sudden emergence onto open sunlit hills of green grass sprinkled liberally with wild oats," says writer Phil Arnot. The Sky Trail is 5.9 miles long and follows the main spine of the national seashore lands, averaging about 1000' above the sea, until descending, at its southern end, to remote Kelham Beach. The trail's northern terminus starts at a car park on the Limantour Road. This gives relatively easy walking access, via side trails, to the slopes of 1400' high Mount Wittenberg and many nice picnic spots, including the area around Sky Camp. Other side trails descend through the douglas fir forest to Bear Valley, making loop walks possible. Besides grassy knolls loaded with spring wildflowers, the trails passes conifers, huckleberries, madrones, bays, ferns, and toyons during its highlands romp. Whether you do two miles or double-digits, this trail has great diversity and is exhilarating. Our Inverness Ridge Room is named after the Inverness Ridge Trail. Your windows take in a superb view of one wind-sculpted, easterly arm of Mount Vision - the majestic centerpiece of the six-mile-long "spine" of the national seashore's northern section known as the Inverness Ridge. From north to south, elevations along the broad ridge range from 400' on pasture-lined L Ranch Road, near Tomales Bay State Park, to 1300' at Mount Vision and Point Reyes Hill, in the middle, then tapering down to 800' at the top of the Limantour Road. Parts of the western side of Inverness Ridge burned in an October 1995 forest fire, burning large sections of the bishop pine forest. This fire opened up coastal views on the upper part of the Mt Vision Road as well as along the three miles of the Inverness Ridge Trail. This trail can be reached from the end of the Mount Vision Road, elevation 1300' or from the trailhead along the Limantour Road, elevation 800'. Besides getting to see the pine forest coming back to life with vigorous new growth, there are terrific views and wildflowers galore, including the pretty blue blossoms of the ceanothus bushes in springtime and the long-lasting, orange monkeyflowers of summer. Whether you do just the ridge walk or the 6.5 mile loop hike, which utilizes the Bucklin, Muddy Hollow, and Drake's View Trails, as well the ridge trail, you have a nice walk going for you. Writer Tacy Dunham: "Views from Inverness Ridge not only give a bird's eye view of Drakes Bay and the Point Reyes Headlands, but also spill over the ridge and include the long, slender Tomales Bay. Looking eastward are the ridges of West Marin and Mount St. Helena (Napa) in the distance." Our First Valley room is named after the First Valley Trail. Your room overlooks the back garden as well as Park Avenue as it climbs steeply up from the valley floor towards the hillside neighborhood here in heavily-forested Inverness. The inn is near the mouth of First Valley Creek, where the fresh water from springs on Mount Vision's eastern slopes, joins the salt water of Tomales Bay. 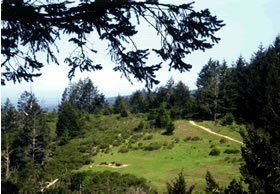 For hundreds of years, the Miwok people lived undisturbed in this abundance of woods, wildlife, and water. The first vacationers - escapees from the city - arrived in the 1880s, camping along "Brook Ness" (as it was called then) and the bayfront. Houses and other buildings started to be built by 1900. One of the first families to settle, the Shafters, had ties to Scotland; thus leading to the place names of community and streets. First Valley is a walker's paradise, whether following the paved neighborhood lanes or snooping out some of the footpaths that weave through the local woodlands. The clear creek is spanned by no less than five lovely footbridges right here in the village! For an energetic walk into the wilds, take Perth Way until it turns unpaved (1 mile from #10), then continue briskly climbing on the right fork's switchbacks another mile or more up the side of Mount Vision, with wonderful glimpses of Tomales Bay seen through the gnarled bishop pines. The other fork is an easier walk with some nice down-valley views and an osprey nest or two along the way. Poet Brock Schreiber: "While strolling in the lovely Inverness woods,/Where the sun shines bright through the ferns and the trees,/Be very quiet and then glance about,/You may see some wood nymphs and fairies as they come out." Our White Gate room is named after the White Gate trail. This is a little-known gem of a trail just uphill of the Limantour Estero. It's just under a mile long and connects the old Muddy Hollow Road with the long and winding Estero Trail. When we first walked it, in the springtime lushness of green grass and wildflowers, we couldn't have come upon a better picnic spot on the hillside just above what we will call the White Gate Pond. This 1/2-mile-long pond nestles among the gentle hills of the pre-national seashore ranchlands, sparsely vegetated yet beguiling. Egrets and herons hunker along the water's edge while vultures circle high above in thermal updrafts. From the White Gate Trail, the heights of Inverness Ridge loom to the east - a mix of forest and chaparral. To the south lies the pretty marsh, with its sinuous creek, at the head of Limantour Estero; then the loch-like Estero itself. Even a smidge of Limantour Spit visible beyond that. The closest access to the White Gate Trail is from Muddy Hollow Trailhead, off the Limantour Road - 2.1 fairly easy miles along the old Muddy Hollow ranch lane. Longer, hillier access is about 4.5 miles from Limantour Beach along the Estero Trail (southern part) or four miles in along the Estero Trail (northern part) from the Estero carpark off the Lighthouse Road. A very nice loop hike of 8.7 miles, starting at Muddy Hollow or Limantour Beach, takes in the White Gate Trail at its midpoint. Keep in mind there aren't many trees in this part of the park - so not much shade and maybe windy. Then again, it might be still and foggy. Some short muddy sections in the spring. Regardless, a great walk at any time of the year! Seashore veteran Phil Arnot: "The Estero region, situated in the northwest corner of the national seashore, has no broad beaches, no ocean caves, no waterfalls, no deep forests or high hills. Yet it is distinctive. It has sweeping moors reminiscent of Scotland and visible, abundant wildlife - bobcats, three types of deer (axis, fallow, blacktail), marsh hawks, and white pelicans, to name just a few."